It's been a very long time since my first time watching this anime, still Ai is as lovely as ever. The way she quietly does all the normal things everyday makes me sad. But beside I must admit that she is the most adorable one I've ever seen. This girl is so pretty! I like her bright eyes. I think that you should put a subtle texture over all of the layers just to tie everything together a bit more. But overall, I like it. It has really good composition and is just nice to look at. haha, by the way... GREAT JOB! Oh wow, awesome wallie. I like the background, so pretty. Looks kinda horrorish, and I love that. :D Thanks for sharing. i like this one too! great job! Enma Ai looks amazing in this! She looks very sweet, and the background is very pretty. whoa enma is so cool! and the way you did this is awesome! i like the shade of red that was used in this wallpaper! suteki na! i loove it! I really like this! The colors seem to bring out the glow in Emma completely. Thanks for sharing! The red is so nice, and she just fits in perfectly. One of my favorite characters of all time~ The colors are very lovely ne? Enma Ai looks so great in your wallpaper. I love her reddish kimono ??? 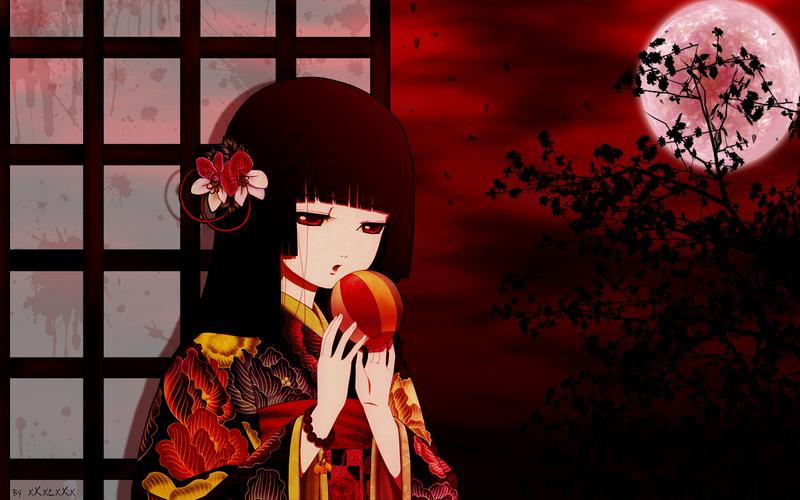 and all the red around her...it feels just like Jigoku. Good Job ! Keep it Up ! and I likes this wallpaper ... Thanks for shared ! so nice!hooooooooom! i like it!